In the early days of web design, working with Taking Your Camera on the Road, I kept frequent “Under Construction” signs on many areas of my site as I poked and prodded its development. The Under Construction signs were to indicate that I was changing the look or feel of the web page’s design, or simply awaiting completion of the article or information and needed a placeholder until all the work was done. Web page design was more complex and cumbersome in the early days. You didn’t have the choice of WYSIWYG, Widgets, or WordPress Themes to quickly layout the look of your site. You had to hand code everything and there was no way of validating the code to help you determine what you did wrong or right. The World Wide Web Consortium, the parent of web standards, wasn’t around and web pages were designed using tables. A lot had to be created in advance and then filled in as we went. Pitiful. Still, did we ever honestly think that once a web page design was done, it was done? Absolutely. Just like any project, when it was done, it was done. While a brochure, poster, newsletter, newspaper, magazine, or any other communication media is “done” when it is published, a website is never done. Sure, printed material always has those behind it wishing they’d done this or that differently, but when completed, it’s done. No changes now. A website, however, is like an ever-changing and evolving entity. It grows and changes with technological advances as well as with changing tastes and trends. It’s there for the tweaking constantly, or just now and then. I’ve changed the look of my sites many times, though not as often as I may have wanted to because I wanted a consistent look for my readers. No sudden surprises. The changes were slow and methodical, gradually introducing them to a new look or feel, trying to keep navigation spots the same through the transitions, then slowly moving them into better places. “No sudden moves” was our policy. Even now, after all these years, I’m still changing Taking Your Camera on the Road, modifying a few tidbits in the stylesheet and a template file just two days ago. It’s a constant tweak and test and check and tweak process, even after all these years. I was recently transferring some old web files to a new backup drive and stumbled across the old Under Construction graphic I used to use and it got me thinking. I wondered if any of the pages on any of my sites still had an Under Construction notice on them. I found a couple. Yikes! Things left undone need doing. It’s not just about the web page design and layout, it’s also about what is undone in the content of the site. I found a few things that needed doing and updating, some long past due and some at least done. Just out-of-date. I have some housekeeping to do. You may or may not have any signs for “Under Construction” on your blog, but you probably have left a few undone things laying around, waiting to be done. Here is a list to help myself and others look for our undone things on our blogs and sites. Core Pages: Have you done your core site pages like About and/or Contact? These web pages are critical to helping the reader learn more about who you are, why you blog, and how to contact you for more information. Unfinished Posts or Articles: Do you have unfinished articles or posts on your blog. Do they need finishing? Do you have a bunch of posts sitting in your Drafts lists? Do they need to be finished or is it too late and you need to delete them? Check the files on your computer to find out if you wrote articles but never copied them into your blog, or if you started them and they just need to be finished so you can paste them into your blog. Unfinished Ideas: I have long lists of article ideas that I want to write about. Some are brilliant ideas, but they sit there waiting until “I have the time” or “I have the motivation”. Well, get motivated and write about these so they can come off your to do lists. Articles With No Photographs – Photographs With No Article: If I’ve been on a major trip or photo shoot, I will often upload images without a story, just to get them published. Then I will forget about writing the story as I’m caught up in the next project. Or I will post a story with the self promise to add images, and then forget about it. 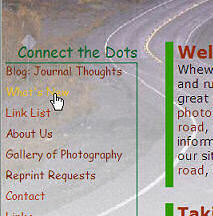 Look around your site for stories without photographs and photographs without stories that need to be finished. Broken Links: I think the housekeeping task of finding and fixing broken links on my blogs is a pain, especially when, like me, you have so many external links. I can’t keep track of every link on every post but I can keep track of the long link lists in my blogroll, link exchanges, link resources, and articles with a lot of links like the article on Hundreds of Resources for Finding Content for Your Blog. I set a schedule to check those massive link resource posts once every 3-6 months, give or take, to make sure that the majority of the links are still good. They can break at any time, so unless someone tells me a link is broken, I might never know. I want the list of link resources to still have value a year or three from now, so keeping those links up-to-date regularly prevents massive work a couple years from now. It’s tedious, but part of the process of blog housekeeping and things needing doing. Technical Updates: While not so much an “under construction” task, the process of finding my “things left undone” reminded me to check for updates for WordPress and WordPress Plugins, making sure I have the latest versions. Keeping your software up-to-date keeps the bugs away and often brings great improvement in speed, accuracy, and quality. Oh, and among your to do list tasks, don’t forget to backup your blog! I hope I’ve helped you remember a few of the “Under Construction”, things-left-undone tasks awaiting you on your blog. This entry was written by Lorelle VanFossen and posted on July 20, 2006 at 1:19 am and filed under blogging tips, Web Design, WordPress with tags site customization, Web Design, wordpress, wordpress design, WordPress Themes. Bookmark the permalink. Follow any comments here with the RSS feed for this post. Post a comment or leave a trackback: Trackback URL. And yet, I still make all my websites in Notepad and the GIMP. The method described sends everything to GMail. A great idea! When I was using wordpress.com to host my blogs, I always forgot to do backups. Instead, I relied upon my RSS feeds to capture my posts. I have never had to rely upon a backup to save a site, and I realize that having to copy all the posts out of an RSS reader could be a big pain, but at least everything would be there. If you choose to do this, just make sure that you set your syndication options (Options>Reading) to show the full text. 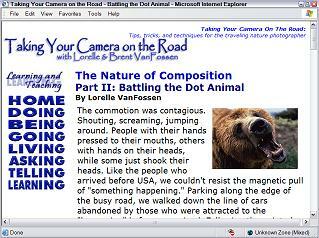 I prefer to use a desktop reader (SharpReader) in conjunction with a web-based one (BlogLines) just to be sure everything gets captured. Long-time lurker, first-time poster. Great list, Lorelle! I’m curious about broken external links: What process do you follow to identify those and how do you go about fixing them? Simple removal, or do you try to figure out if they’ve moved to a different location? I explain this thoroughly in Site Optimization – Checking Loose Links, but the simple answer is to run your pages through link checking utilities and services. These will often tell you if the link is completely dead, redirected, and if the move is temporary or permanent. If redirected and permanent, then change the link to the new location. If completely dead, and you still want to link to that or similar material, hit the search engines to find a replacement. Many sites change the programming code, going from ASP to PHP, or they change their structure in some way. They may or may not have included all the redirections, or removed them because they were old, in their .htaccess file, so a simple search would turn up the current URL. Just copy and paste the right one in and it’s done. It’s tedious, and brain numbing, but it’s part of the process. Perfect — exactly what I needed. Thank you! The reason there’s no “Beta” anywhere on the site. That’s just the Web 2.0 “Under Construction” graphic.